While pundits and CEOs spout platitudes about jitneys, San Francisco’s last real jitney has been driven out of business. 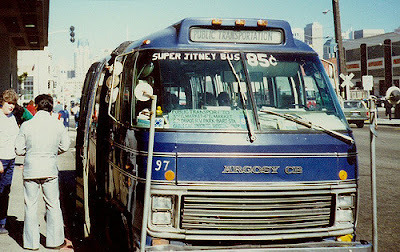 Real San Francisco: Jitney 97 in groovier times. Creative Commons photo by Mark Wahl (Flickr). On January 20, 2016, San Francisco’s last jitney ceased operation. Strangely, there was no media fanfare or lament, even though jitneys are frequently in the news—not real jitneys, mind you, but the jitneys of folklore. Jitneys are being claimed as ancestors by all sorts of new “disruptive” modes of transit—including Uber, Lyft, Leap, and (more plausibly) Chariot. Yet while jitneys are being celebrated in legend, the last real jitney quietly expires. Jesus Losa, operator of Jitney 97, blames operating expenses and a decline in passengers for his troubles. He also tells a shocking tale of harassment by parking officials around Caltrain, racking up $10,000 in tickets, even though his is not a private vehicle, but a licensed San Francisco jitney. It’s as if a Muni bus were ticketed each time it stopped in a bus zone. This harassment has also cost him passengers. Losa’s loading zone at Caltrain was moved far from the entrance, to the white-curb zone behind the taxi stand on Townsend—where, he says, passengers have trouble finding him. On top of this, parking officers, once again, ticket him if he stands in this zone for more than five minutes, even though he drives a public jitney, not a private vehicle, and often needs more time to fill his 23-seat bus with passengers walking over from the Caltrain entrance. Jitneys (technically: semi-fixed route shared vehicles for hire) first hit the streets of San Francisco just over a hundred years ago, in late 1914. Their fortunes waxed and waned until the 1970s, when a combination of competition from the newly-built BART system, increased insurance costs, and changes in licensing rules pushed them into a decline. Losa started driving his jitney in 1972. Since 1985, his jitney, number 97, has been the only remaining one in operation in San Francisco. Just under a month after Losa stopped driving, Uber CEO Travis Kalanick told a story about jitneys at the 2016 TED talks in Vancouver. (The presence of the CEOs of Uber and AirBnB at the once-progressive TED talks led to some controversy, and the speculation that “we have reached peak TED”). The version of the jitney story that Kalanick told is one that has been tossed around by free-market apologists for the last few decades: the jitney was a disruptive transit innovation that moved people in shared vehicles instead of private ones; this innovation, despite being popular, was quickly quashed by the streetcar lobby. Jitneys, according to this story, were a long-ago innovation ahead of their time. They are claimed as the inspiration for the new “ridesharing” services like Uber, Lyft, etc, and serve as a lesson about the negative consequences of over-regulation. There are several problems with this story—not the least being that jitneys did not disappear, but survived (almost) up to the present, precisely in those places (such as San Francisco) where they were regulated. The real history is a lot more complicated than Kalanick’s neoliberal fable (I’m planning to write about some of this history in an upcoming post). As far as the demise of jitney 97 is concerned, regulators do not look innocent—but neither does Uber. 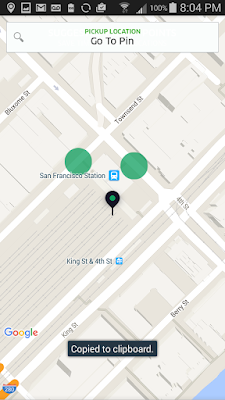 The Uber app encourages Caltrain passengers to hail from a "suggested pickup point" on Townsend, where drivers risk a $288 ticket. It is no concern of Uber’s whether neophytes among its rapidly turning-over horde of expendable drivers get stung by these tickets. Any drivers who wise up and learn to avoid picking up there are quickly replaced by clueless new recruits. So as long as Uber drivers continue to spawn at a high enough rate that they can throw themselves against the bus stop like wave after wave of kamikazes, Uber can continue to service passengers right at the Caltrain entrance. The rules are just different when you're as big as Uber. While they try to claim its heritage, Lyft and Uber are no replacement for the jitney. A Lyft Line or Uber Pool trip between Caltrain and Fourth and Market (Losa’s route) costs about $5, over twice the jitney fare, which is tied to the rate charged by Muni. Lyft Line and Uber Pool carry between one and four passengers per trip; Jitney 97 had seats for 23. Which means that, at their most efficient, it still takes more than five TNC cars to carry the capacity of the last jitney. And while Losa served the streets of San Francisco for 44 years, the typical Uber driver is lucky to last six months. It is powerfully ironic that the last public, licensed jitney has been driven out of business, even while the city cuts deals with Silicon Valley corporations to allow private tech shuttles to use the city’s bus stops. But sadly, it isn’t really surprising that the powerful get their way while the little guy gets squeezed out. As for Losa, he says his plan now is to relax, and he doubts he will be able to get back in business. When I ask him about getting some journalists interested in telling his story, he laughs, and is skeptical that it will do any good. Nevertheless, I’m writing this post in the hope that some journalist (a real one, not the writer of some dorky blog about “taxicab subjects”) will pick up Losa’s story. It deserves to be heard.